Father Mitrophan, his Chinese name being Chang Yangji, was born on January 17, 1856. Yangji was born into a family of Chinese Orthodox associated with the Russian Orthodox Mission in China. His father died while he was very young, and he was raised by his mother Marina, who was a teacher at a school for girls, and his grandmother Ekaterina. He grew to be a humble person who was cautious and quiet. He was peaceful in demeanor and was impassive even when faced with great insults. In 1864, when Archimandrite Pallady returned to lead the Russian Orthodox Mission for a second time, he charged Yangji’s teacher Juren Long Yuan with taking care of Yangji’s education so as to prepare him for ordination. Although urged by both Archimandrite Pallady and his teacher Long Yuan, Mitrophan was reluctant to accept ordination and constantly refused it asking, “How can a person with insufficient abilities and charity dare to accept this great rank?” Archimandrite Pallady’s 1878 successor as the mission leader, Archimandrite Flavian, continued to urge Mitrophan to accept ordination. Obedient to his leader’s urging, Mitrophan finally accepted ordination as a priest. 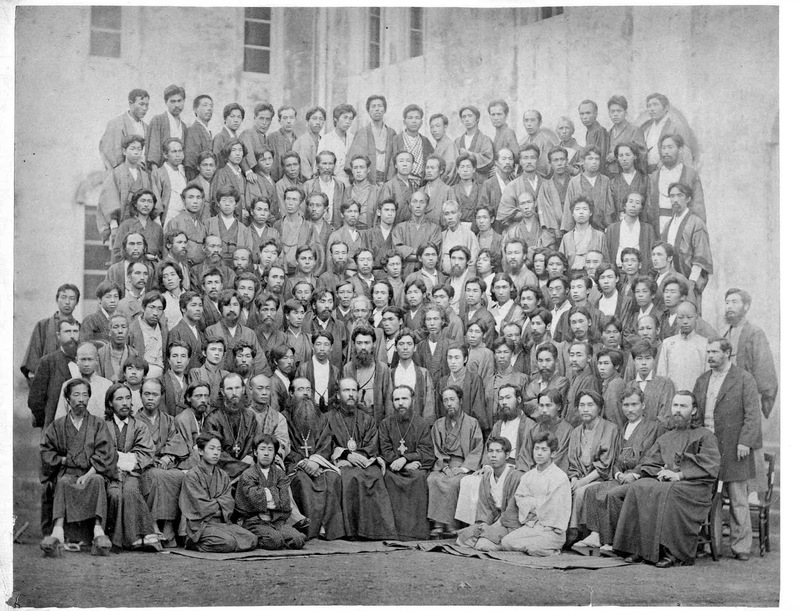 As there were no bishops resident near Beijing, Archimandrite Flavian, Mitrophan, and two others as candidates for reader journeyed to Tokyo, Japan, in June 1882 to see Bishop Nicholas of the Japanese mission. 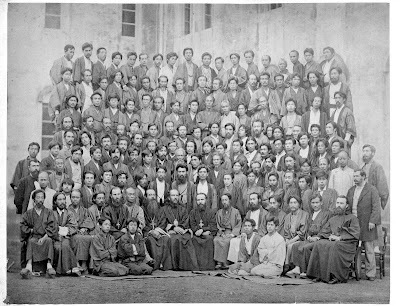 The delegation arrived the month before the meeting of the All Japan Council of 1882 which Archimandrite Flavian and Fr. Mitrophan attended. Prior to the council Bp. Nicholas ordained Mitrophan deacon on June 20 and blessed his fellow travelers, Paul and Eumenius, as readers. On June 29, 1882, Bp. Nicholas ordained Mitrophan, who was 25 years old, as the first Chinese priest of the Orthodox Church. The ordination was held in the Tokyo Cross Church, that was on the second floor of the bishop’s residence on Surigadai Hill in Tokyo. For the next fifteen years Fr. Mitrophan, in addition to attending to his priestly duties, assisted Archimandrite Flavian in translating and editing books. He served God tirelessly even as he suffered hurts and insults both from his own people and outsiders, eventually causing him a mild breakdown. For the next three years Fr. Mitrophan lived outside the Beijing mission. Tokyo Cross Church, where St. Nicholas of Japan ordained St. Mitrophan. On June 1, 1900, an uprising of the anti-foreigner Chinese began against Chinese Christians that came to be known as the Yihetuan Movement Uprising (Boxer Rebellion). The Beijing mission buildings were burned. Many of the refugees from the mission came to Fr. Mitrophan’s home, looking for safety. Many of these were former ill-wishers of Fr. Mitrophan, but he did not turn them away. Over the next several days Fr. Mitrophan endeavored to strengthen them in their ordeal. On June 11, a force of Boxers aided by Chinese soldiers descended on his home and began systematically torturing and killing the Christians who had taken haven there. Fr. 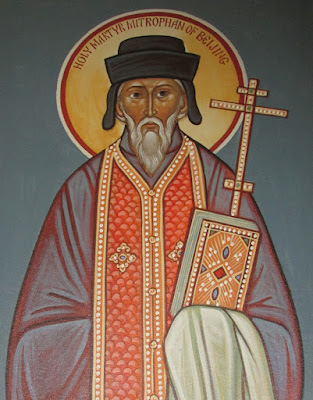 Mitrophan was martyred sitting in the courtyard of his home where other members of his family were also tortured and died martyrs: his wife Tatiana, and three sons, Isaiah, the priest Sergei, and Ioann. 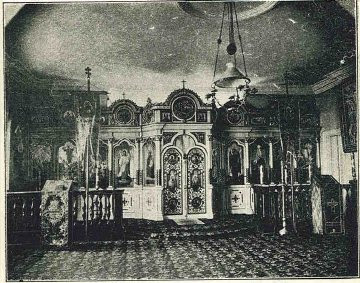 His body was recovered by Hieromonk Avraamy. In 1903, his body was among the 222 Chinese martyrs placed under the altar in the memorial Temple of All Holy Martyrs constructed on the grounds of the Russian Orthodox Mission in Beijing. This temple was destroyed by the Soviets in 1957. 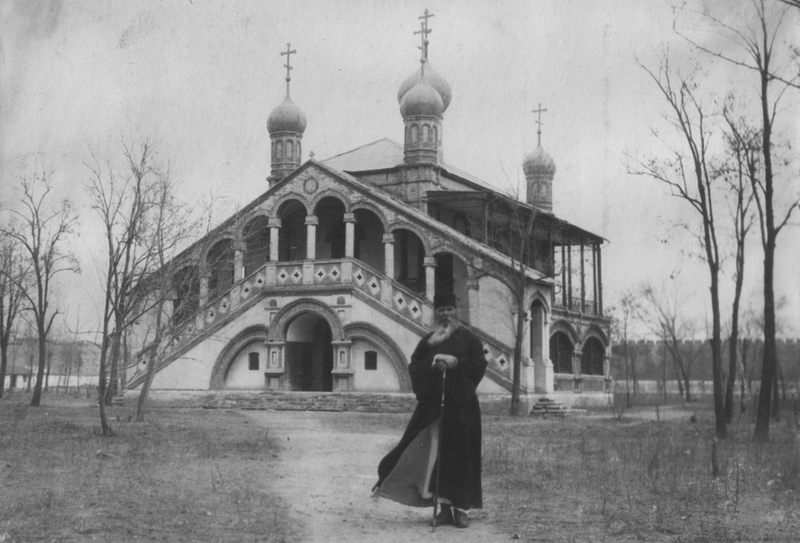 Church of All Holy Martyrs, built over the site of the martyrdom of the Chinese martyrs, destroyed by the Soviets in 1957. TATIANA, 44 years of age at the time of her martyrdom. On June 10th Tatiana was saved from the Boxers with help from her son Isaiah's bride, but on the following day, June 11th, she was seized in the morning and together with 19 others, was sent outside the Āndìngmén Gate to Xiaoyingfang, to the Boxer camp and was then executed by beheading, at the place where there is now the "Treugol'nik" [Triangle], an almshouse for the poor. ISAIAH, served in the artillery for 23 years. On June 7th, the Boxers executed him by beheading on the big street near the Píngzémén Gate, because it had been known that he was a Christian. IOANN (John), was 7 years old at the time. On the evening of June 10th, when Fr. Mitrophan was killed, the Boxers split Ioann's shoulders and severed his toes. His brother Isaiah's bride managed to save him from death by hiding him in a latrine. In the morning he sat at the entrance without clothes and shoes, and when people asked "are you hurting? ", he answered "it doesn't hurt." Boys scoffed at him, calling him "èrmáozǐ", but he answered, "I believe in God, and am not èrmáozǐ." He got used to answering thus, because the pagans constantly called Christians devil's disciples, (the word "èrmáozǐ" has this meaning). Ioann asked neighbors for water, but they not only did not give it to him, but chased him away. Protasy Chang and Irodion Xu, who were not yet baptized, testify that they saw this boy with wounded shoulders and feet; the wounds were 1¾ inches deep, but he felt no pain and, when seized again by the Boxers, he felt no fear and went peacefully. One old man expressed a regret about him, saying "What is this boy guilty of? It is his parents' fault that he became a devil's disciple." Others made fun of him, derided him, or simply smiled with contempt. So he was taken as a lamb to slaughter. MARIA, 19 years old, bride of Fr. Mitrophan's son Isaiah. Two days before the Boxer's pogrom, she came to Fr. Mitrophan's home, wishing to die with her groom's family. When the Boxer's surrounded Fr. Mitrophan's house on June 10th, she very courageously helped to rescue others, supporting them in climbing over the wall. When the Boxers and soldiers broke down the doors and entered the courtyard, Maria bravely accused them of beating people lawlessly and indiscriminately, and they didn't dare to kill her, but simply wounded her hand and pierced her leg. In general, she exhibited uncommon courage and sense. Fr. Mitrophan's son Sergiy three times tried to convince her to leave and hide, but she answered: "I was born near the Church of the Most Holy Mother of God and here I will die" and she remained where the church was. Soon soldiers and Boxers arrived there, and the courageous woman was martyred, considering death as departure to a place of blessed rest.